Are you someone who enjoys taking pictures, even if it's just a hobby? Maybe you're someone who only takes a few pictures here and there of the family and kids. Did you know you can take your photography skills and make a living with them? It's true. And you don't have to have incredible photography skills to get started in this business either. You can use your photography skills to create a nice part-time income for yourself or you can go all in and do it full-time. It's entirely up to you. 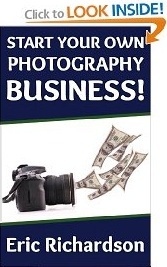 Start Your Own Photography Business! takes you by the hand and walks you step-by-step to show you exactly what you need to do to get your own photography business up and running. Starting your own photography business is something you can definitely do. And it's not as hard to do as you might think. Let this guide show you the way. Earning a living in photography is something you can definitely do. And in this book I'm going to show you the ins and outs of the business. We'll go over everything you need to become a successful photographer. How will we defines success? It's simple. Success means being able to earn a paycheck for the pictures you take, regardless of whether you decide to do this on a full-time or part-time basis. Before we get into the nuts and bolts of the business, however, we need to get a few things out of the way. We need to knock down a few common false perceptions about this business. It's best we do this up front before digging any deeper. You do not need to be a highly skilled photographer to make a living with your camera. This is probably the most common false assumption about the photography business. Most people think you need to be an expert at the craft in order to turn pro. It simply isn't so. As long as you can take pictures with decent composition and clarity, you can definitely start charging for your services. Remember my first wedding gig? Most of the pictures I took weren't fancy at all. At the end of the day it wasn't my amazing artistic ability that earned my paycheck. It was simply my ability to recognize memorable events as they occurred and capture them on film. That was it. It doesn't take much practice to get to the point where you can start taking photos you can be proud of and that people will pay you for. It happens faster than you may think. You'll know when you're ready. You do not need expensive equipment to get started. This is another big one that many people get hung up on. The common belief about the photography business is that you have to have thousands of dollars worth of equipment to be considered "professional" and to take amazing pictures. Again, this assumption is completely false. You can get started earning a paycheck with your picture taking skills with just a few pieces of equipment. We'll go over all of the equipment you'll need and even check out a few ways you can purchase high-quality equipment for a fraction of the cost in another chapter. For now though, you can rest assured that you do not need to spend a lot of money to get into this business.